A Berry Happy New Year from Form and Foliage! California buckthorn (Rhamnus californica) ‘Eve Case’ has deep purple berries in winter. The solstice has passed and the new year is upon us. This is supposedly the drabbest, dreariest time in the garden. To disabuse all of the belief that that must be so, we present a gallery of berries to enjoy as we wave farewell to the old year and welcome the new. ‘Professor Sprenger’ crabapple is known for its lovely springtime apple-blossom pink flowers, but oh the fall and winter fruit! Even the immature fruit of ‘Professor Sprenger’ is decorative. 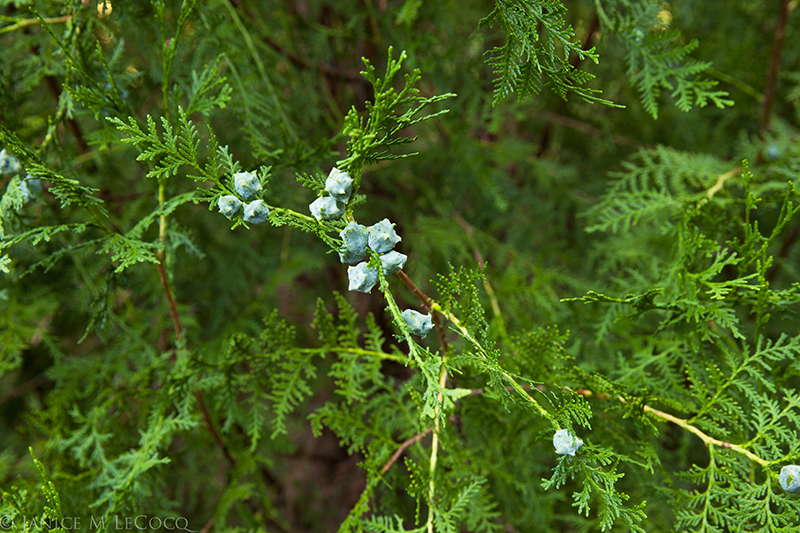 Wilson’s barberry berries range in color from flamingo to salmon, and contrast beautifully with the glaucus foliage. The berries of Berberis aquifolium (formerly Mahonia aquifolium). It’s easy to see why the common name is Oregon grape-holly! Japanese barberry fruit on a rainy winter day. Berries are a great way of adding purple to your fall and winter garden, and there are a variety of trees and shrubs that bear berries of regal hues. 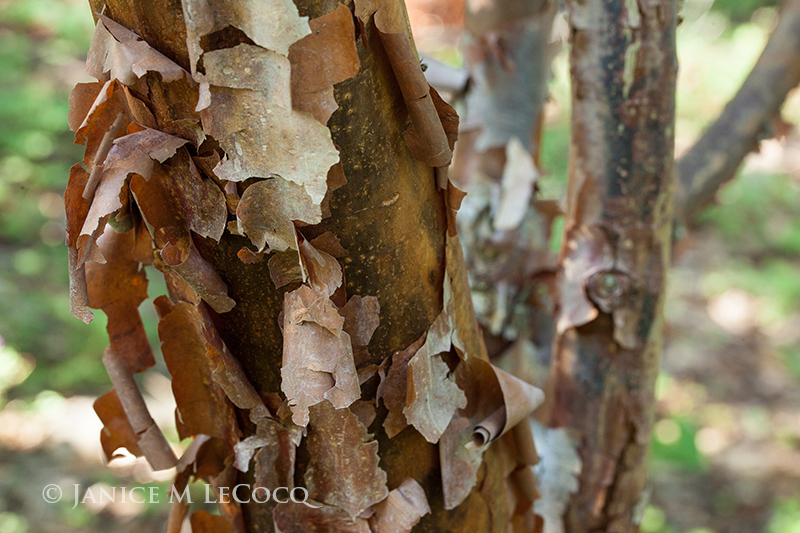 Luma apiculata has shiny purply-black berries that last for months. For purple punch, though, it’s hard to beat beautyberry! (This specimen is Callicarpa bodinieri var. giraldi ‘Profusion’). California native Heteromeles arbutifolia (toyon) can hold its own in a berry contest. Cotoneaster berries can be very decorative, but make sure to select only non-invasive species. Cotoneaster buxifolius is commonly called bright bead cotoneaster. It has an attractive low, spreading habit and wears its berries for months in winter. Sarcococca ruscifolia (sweet box) is grown primarily for its fragrant flowers, but don’t forget the ensuing berries ! Nandina domestica is overplanted, and paradoxically, under-appreciated. Try the ‘Compacta’ version for a more manageably-sized shrub. The cultivars with dramatic foliage generally do not bear fruit, so go with the old standby for winter berry interest. Berries on Nandina domestica ‘Compacta’ last for months in the garden, weeks if brought inside as holiday decor. And of course we cannot leave out the traditional holiday berry, the holly! There are many kinds of holly, most with red berries, but some have golden or yellow fruit. Some even have variegated leaves. Holly is the traditional winter holiday berry. So if your garden is dull on a winter’s day, put ‘berries’ on your gardening shopping list for spring. We have a tendency to buy plants when they are in bloom and most of us don’t visit nurseries during the off-season, so you need to think ‘winter’ even when you’re shopping in April. You will be rewarded when December rolls around. Here’s to a berry wonderful 2016 from Form and Foliage! Categories: Berries, Circle Oak Gardens, Close ups, garden photography, Winter | Permalink. Categories: Berries, Circle Oak Gardens, Close ups, Winter | Permalink. 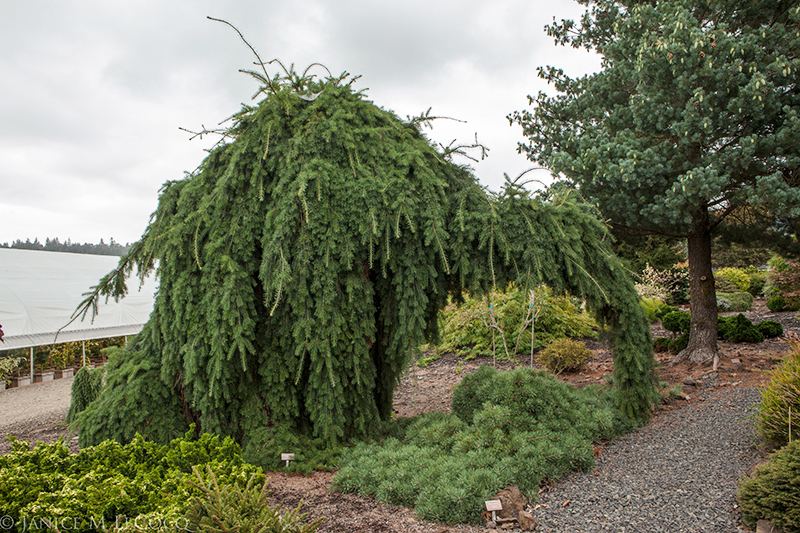 ‘Noyo Dream’ has rich green glossy leaves, contrasting beautifully with the graceful, weeping Dacrydium cupressinum. Say Rhodendron to most people, and they will envision shrubs dripping with large, showy blossoms. Indeed, the name comes from two ancient Greek words meaning ‘rose’ and ‘tree’. We toured the Mendocino Botanical Gardens and the nearby private Gardens at Harmony Woods last week, but we focused on ‘dendron‘, rather than ‘rhodo‘! Large leaved Rhododendron macabeanum graces the stone bridge at Harmony Woods. November is not the time of year when Rhododendron are thought to take center stage as garden divas, or are even believed to shine as notable members of the chorus. However, by selecting plants with attributes other than simply the showy trusses, one can have the exuberant floral display in spring, AND have gorgeous foliage, bark and structure all year round. The Rhododendron macabeanum, pictured above, has enormous leaves of bright, deep green, which are plenty decorative during the months that the plant is not in bloom. A hand and arm provide scale; R. macabeanum really has huge leaves! Many Rhododendron serve year-round as stunning broad-leaved evergreens. They can have glossy, textured or pubescent (downy) foliage in a wide range of greens, with lovely shapes and interesting branching and bark. R. ‘The Honorable Jean Marie de Montague’ has chartreuse buds, which are echoed in the surrounding plantings. Rhododendron provide form and interest to the garden even when most of the other plants have gone dormant for the season. Like Magnolias, they set their buds the year before they flower, so they carry them through the fall, winter and early spring. Both their leaf and flower buds are structural, and are often contrasting colors of chartreuse, rusty brown or maroon. R. yakushimanum x ’Sir Charles Lemon’ is a beautiful shrub with rusty accents. R. neriiflorum var. neriiflorum ‘Rosevallon’ is really coy. It’s an unassuming plant (which doesn’t even have a particularly showy flower) with narrow, deep green elliptical leaves. Hidden beneath those leaves, however, are deep claret undersides, which match the tightly furled flower buds. This is a seldom seen plant–if you encounter it, be sure to turn the leaves over! Look at the way the buds and the leaf undersides are color-coordinated! Other cultivars have extremely decorative leaves, with a range of colors and patterns far beyond what most of us associate with Rhododendron. This stunner, pictured below, which we saw at The Gardens at Harmony Woods, is not available commercially, and it has been nicknamed ‘The Hybrid’ because it is a result of so many crosses between both species and hybrids. There are others of similar hue, however. This Rhodie reads ‘blue’ in the landscape, especially when contrasted with its deep green ruff of Cryptomeria j. ‘Ryukyu Gyoku’. Rhododendron ‘The Hybrid’ with its sugary coating. R. pacysanthum is another Rhododendron with silvery blue leaves. Rhododendron pachysanthum has silvery leaves that are decorative enough to be flower clusters. There are even variegated cultivars, such as ‘President Roosevelt’, which provides plenty of interest in the autumn and winter garden. This beauty is part of the collection at the Mendocino Botanical Gardens. Many Rhododendron also have deeply textured leaves, some of which are puckered, which is botanically described as ‘bullate’. There are even Rhododendron that make their statement by the shape of their leaves. R. orbiculare subsp. orbiculare (that should make it doubly clear to all that the leaves are round!) has crisp green lily-pad leaves with chartreuse buds and veins. It is one of the most charming plants we encountered, and needs no flowers to assert its individuality or its garden-worthiness. Hard to believe that this is a Rhododendron! This nuttallii form was a 2013 American Rhododendron Society pick of the year, and supposedly has huge, fragrant blossoms. We fell in love with the crinkly violet leaves! Both the Mendocino Botanical Gardens and The Gardens at Harmony Woods are in USDA zone 9b or Sunset zone 17, meaning that freezes are rare. However, there are many, many hardy Rhododendron. If this essay has inspired you to learn more, try the American Rhododendron Society (ARS) for a wealth of information about cultivars and how to grow them. The Gardens at Harmony Woods are private, but are open by appointment to members of the ARS and the American Conifer Society; members may consult their directories for information. Non-members: one of the benefits of belonging to these societies is access to wonderful private gardens, which provide enjoyment and inspiration for your own gardening endeavors. Membership is inexpensive and opens up new worlds of plants and people! Categories: Autumn, Close ups, Private Gardens, The Gardens at Harmony Woods, Trunks and Bark | Tags: conifers, evergreen shrubs, foliage color combinations, foliage gardening, foliage plants, Mendocino Botanical Gardn, plant selection, rhododendron, woody shrubs | Permalink. We are known to wax poetic at Form and Foliage over the joys of, well, form and foliage. Most of the time, that means that we show you gorgeous woody plants and their leaves, with a generous sprinkling of ornaments such as cones and berries. 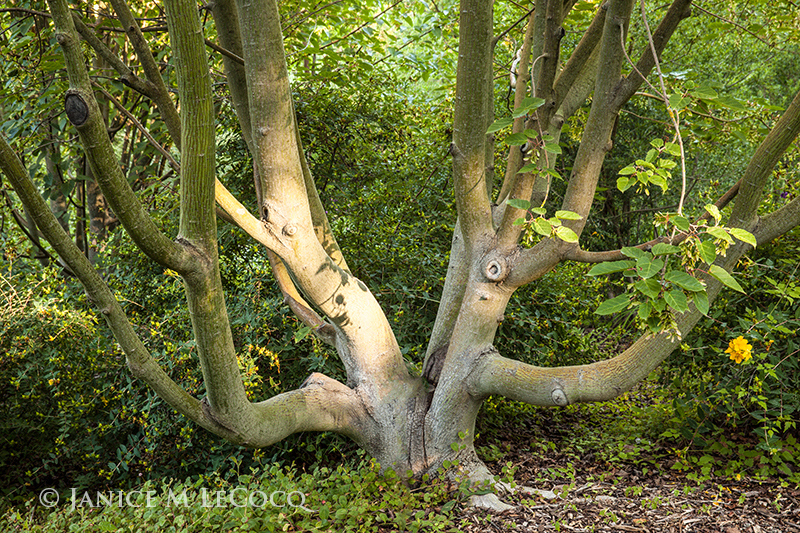 Now, however, we’d like to direct your attention to a part of the plant that tends to get short shrift in garden photography, and in our view contributes much to a tree’s eye appeal: the trunk. In fact, there are some trees, such as this paper bark maple (Acer griseum) photographed at Quarryhill Botanical Garden, that would be worth having even if they remained leafless! The paper bark maple actually has very nice leaves, albeit not the most dramatic. 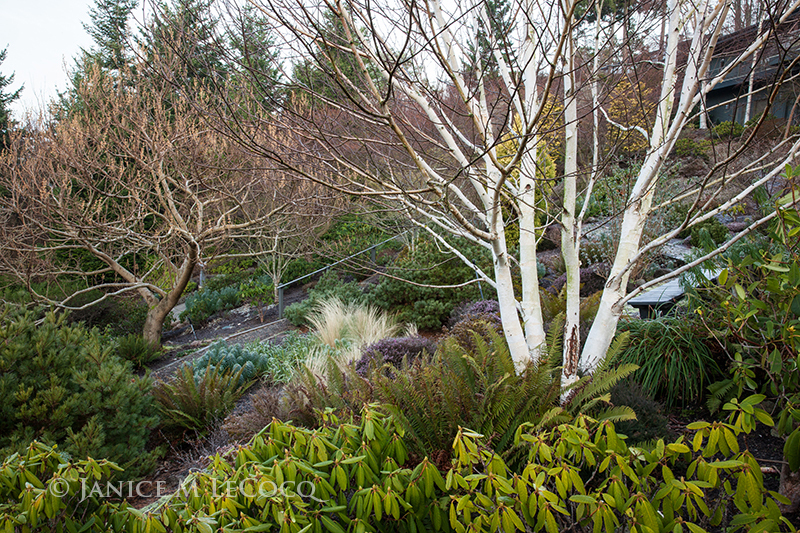 But the peeling bark adds texture and interest to the garden all year long. 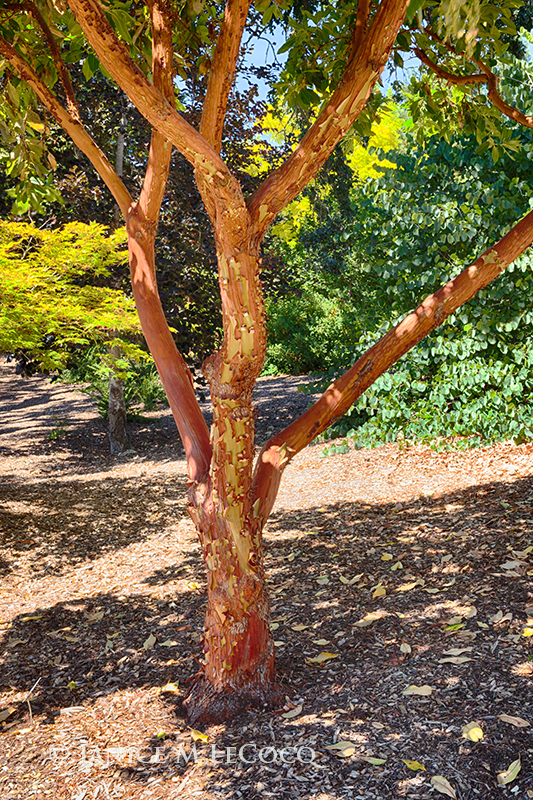 Another tree with peeling bark is Arbutus ‘Marina’, a hybrid cultivar of our native California madrone. 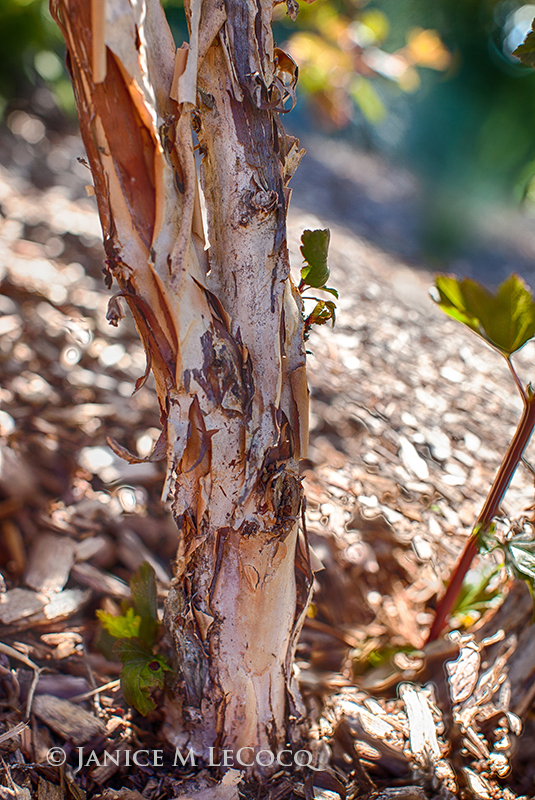 The young trees have semi-gloss, cinnamon bark that, when it ages, breaks open to display a chartreuse under-layer. The evergreen leaves, flowers and fruit of this tree are all stunning, but the trunk is the attention-grabber. While we’re on the subject of peeling, let’s look at Physocarpus, a shrub whose trunk peels with such abandon that its common name is ninebark. We’ve never counted the layers, but we make a point of pruning this shrub to showcase the lovely textured trunk. Like Arbutus ‘Marina’, ninebark has beautiful leaves (in colors that range from gold and lime to copper and maroon), flowers and berries. Not all trunks have to be burlesque strippers to command attention, however. Some do it simply with grandeur and presence. 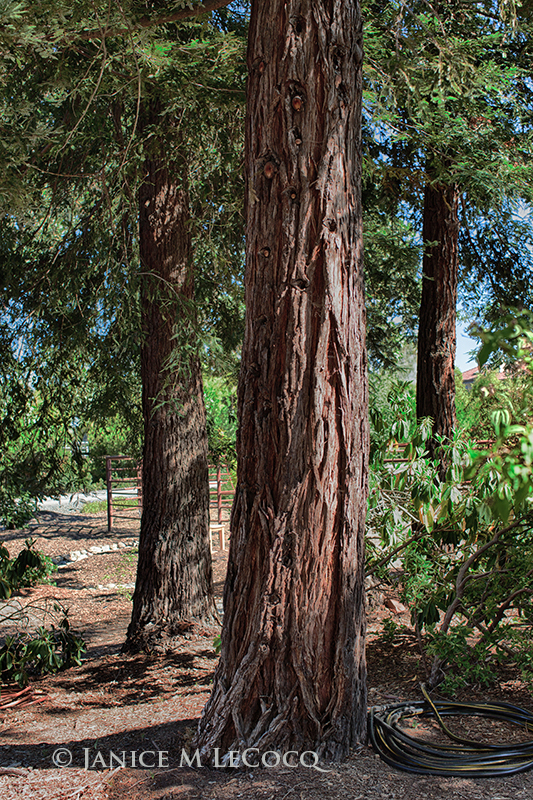 The redwood crown provides shade but the trunk adds sculptural and textural interest, as well as rich color that deepens in the winter rains. Some trees, such as olives, are known for their naturally occurring intriguing, twisted shapes, which can be enhanced by careful pruning. The tree on the right is showcasing the characteristic knobby protuberances that develop as the trees age. 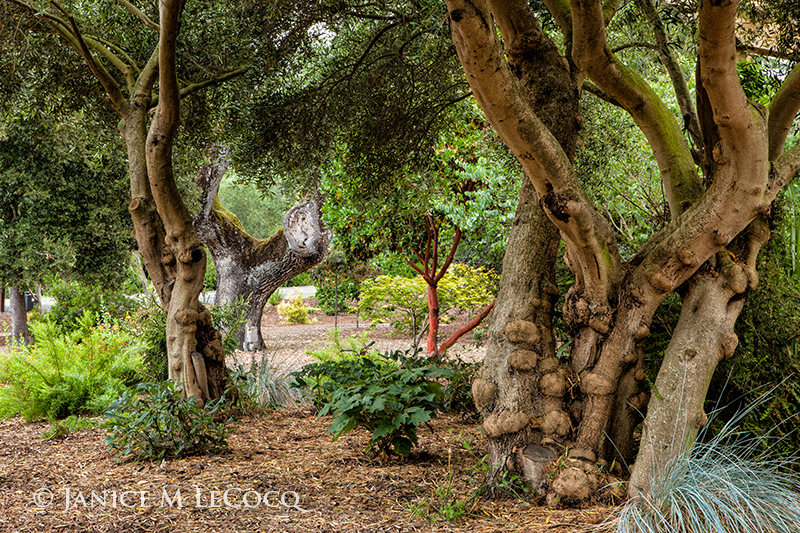 These olives were planted as small trees about 12 years ago, primarily for shade, but now also serve as sculpture. In this trunk trifecta, the olive trunks in the foreground are echoed by the cinnamon trunk of Arbutus ‘Marina’ in the middle and that of the aged live oak (Quercus agrifolia) in the rear. Color, texture, shape—these trunks have it all! And as we remind you repeatedly, they don’t hibernate in winter. 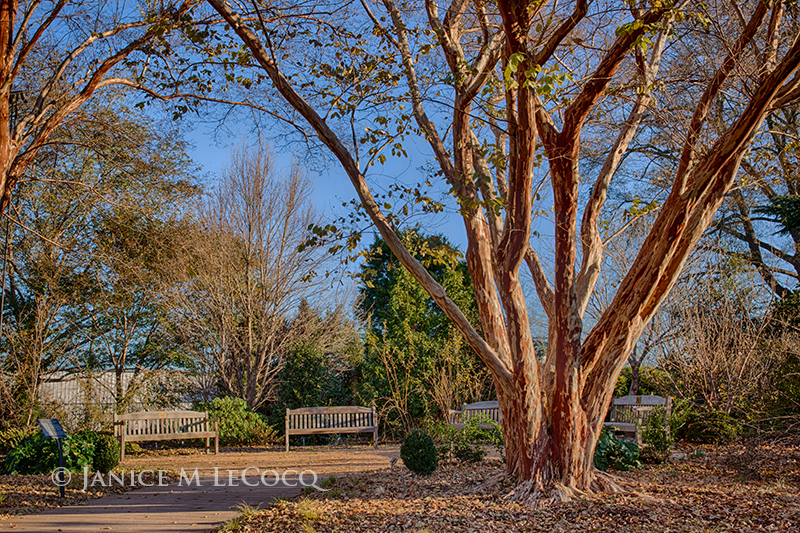 This David’s maple is less than 25 years old and serves as a sculpture—and a bench!—in the woodland landscape of Quarryhill Botanical Garden. It stands out against the surrounding thicket and provides plenty of interest, even when bare of foliage. 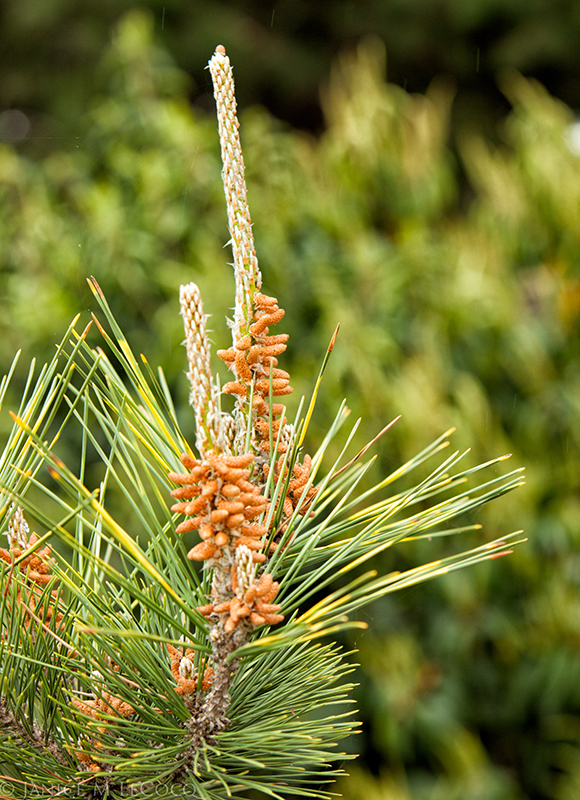 Larches are unusual amongst conifers in that they drop their needles each year, leaving only bare trunk and branches. 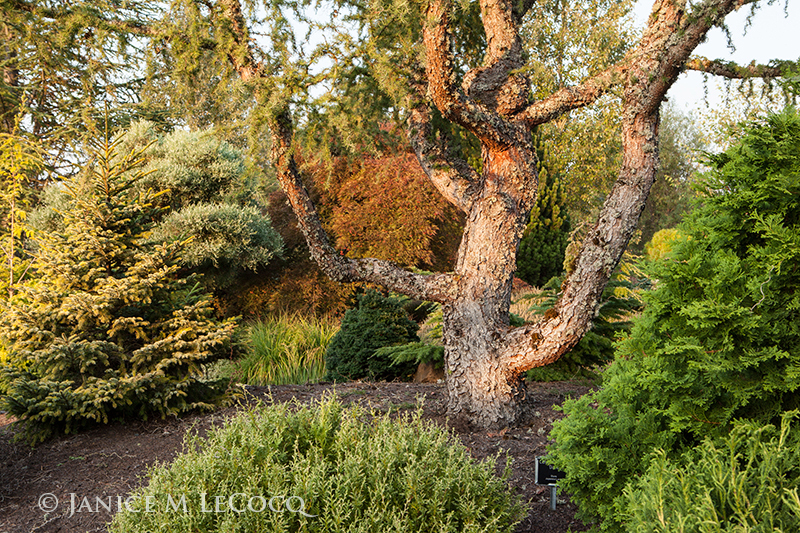 The Larix kaempferi ‘Diana’, pictured above, holds court in late autumn at The Oregon Garden, with its shaggy, sculptural trunk and branches festooned with lichens. Some trunks make their statement by their color rather than their form or texture. The stark white trunks of Betula papyrifera, or paper birch, are much more visible in winter when the tree is leafless. On drab days they light up the garden and draw the eye. 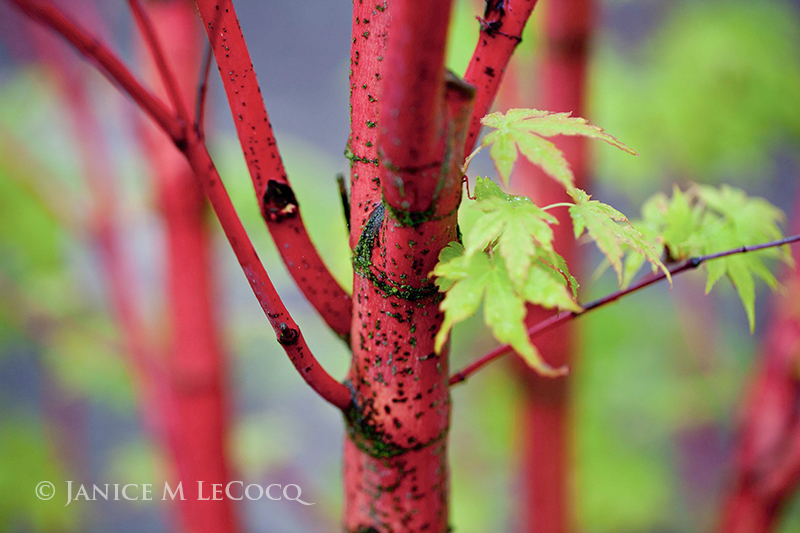 The trunk of this red-twig dogwood is so incendiary that its name – Arctic Fire – is patented! 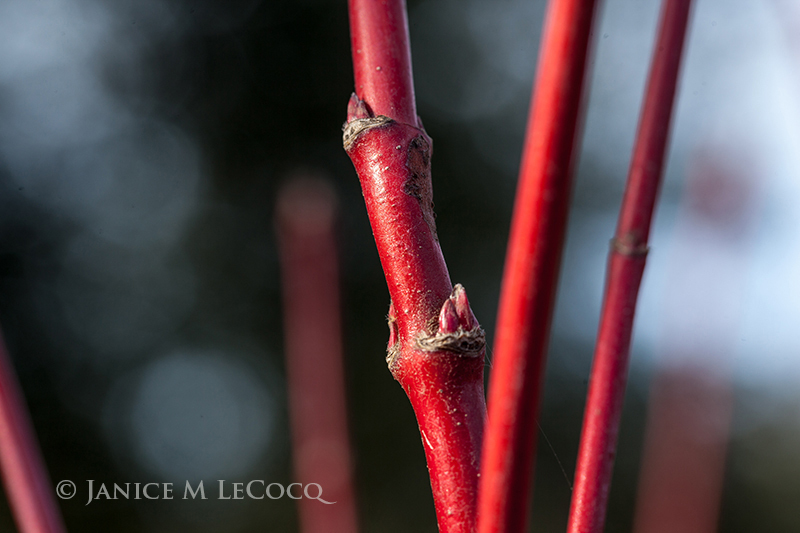 Red-twig dogwoods (Cornus stolonifera spp) are an easy way to add boldly colored trunks to the winter landscape. Unassuming shrubs when in leaf, they take center stage when wearing only their bare branches. There are yellow-twigged versions, as well. 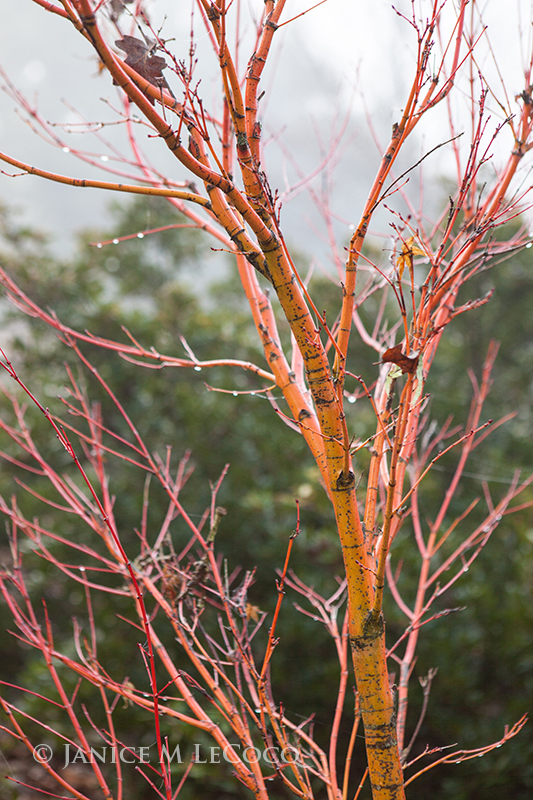 Our ‘go to’ tree for red trunks and stems is the coral bark maple, whose botanical cultivar name ‘Sango Kaku’ means ‘coral tower’ or ‘coral pillar’ in Japanese. The above shot was taken in spring as the tree is leafing out with chartreuse foliage, and the drama of the complementary colors (remember the color wheel!) is evident. ‘Sango Kaku’s autumn display is more muted, as the leaves turn to soft yellow-orange. 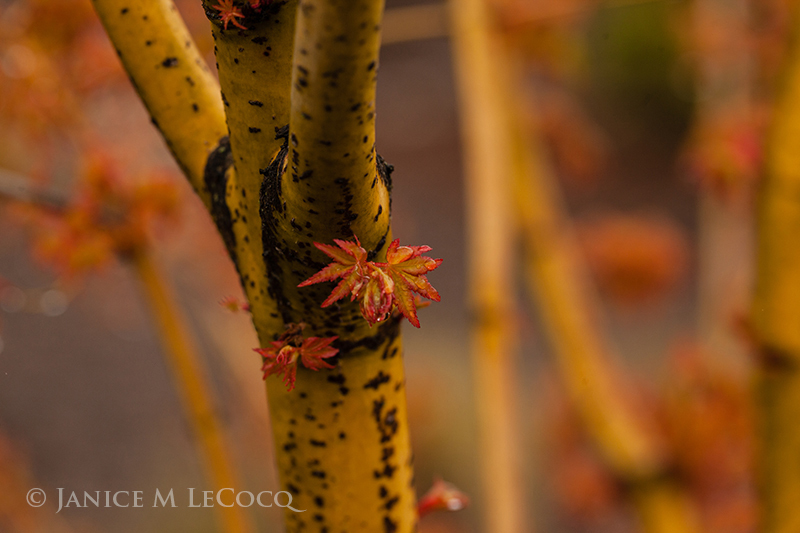 Coral bark maple is a lovely small tree that grows in full sun in our zone 9b. There are dwarf varieties available, as well, such as ‘Aka Kawa Hime’. The red tends to be most vivid on new growth, so the dwarf, slower growing cultivars will provide more eye candy at eye level. Japanese maples have trunks with all shades of yellow, gold and green, as well as coral. 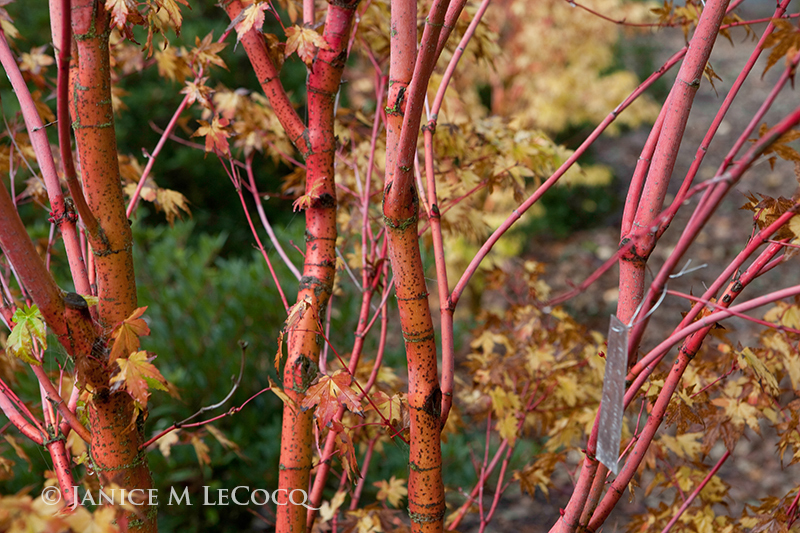 In addition, they have some of the loveliest shapes, most delectable new growth and gorgeous fall color of any trees. Surely you have room for just one? Categories: Circle Oak Gardens, Close ups, Trunks and Bark | Tags: bark, foliage gardening, interesting tree bark, tree bark, tree trunks, trees | Permalink. 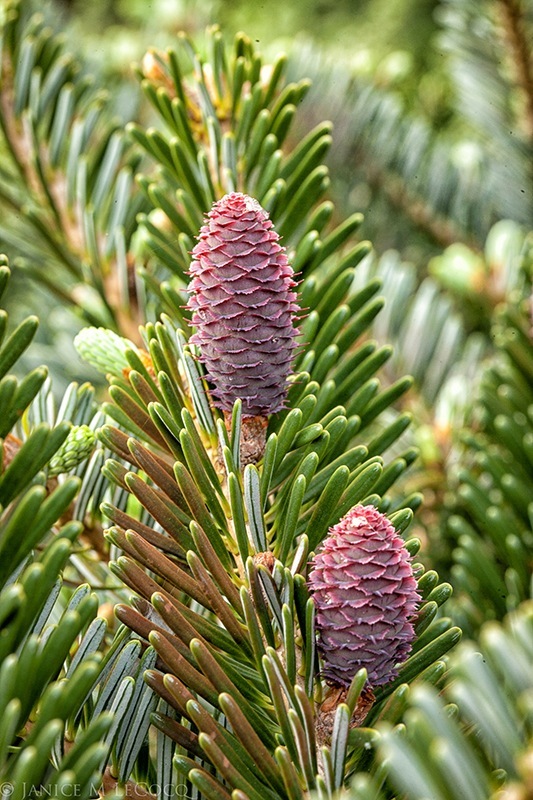 There are lots of reasons to add a few conifers to your landscape, and one of the most compelling is the decorative cones that many bear. 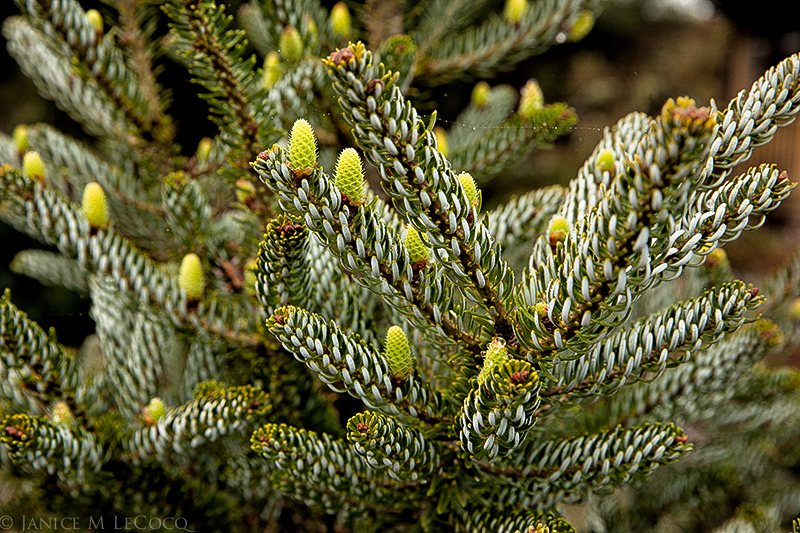 Fir, or Abies, have the reputation for having the dressiest cones, but as you’ll see, even the under-appreciated pines put on some stylish decoration that lasts all year. So slow down and observe when you pass a conifer and enter the ‘cone zone’! 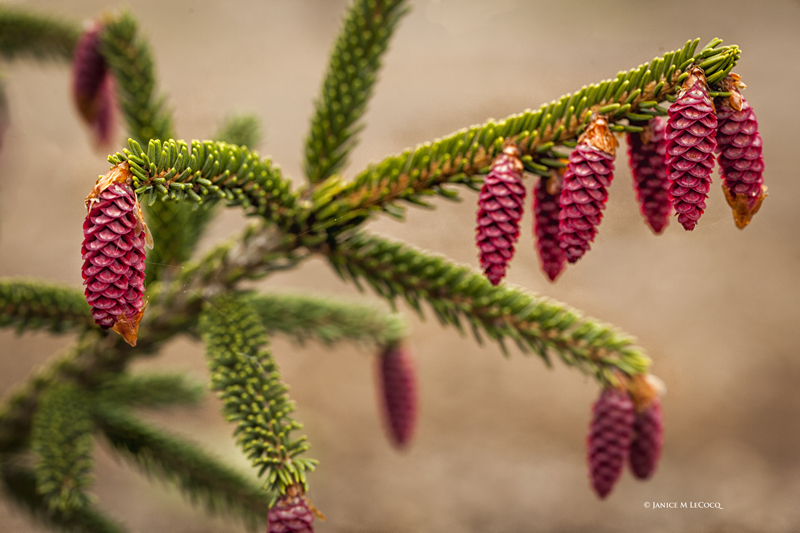 Wine red female cones drip off the branches of Picea orientalis ‘Early Gold’ in spring. 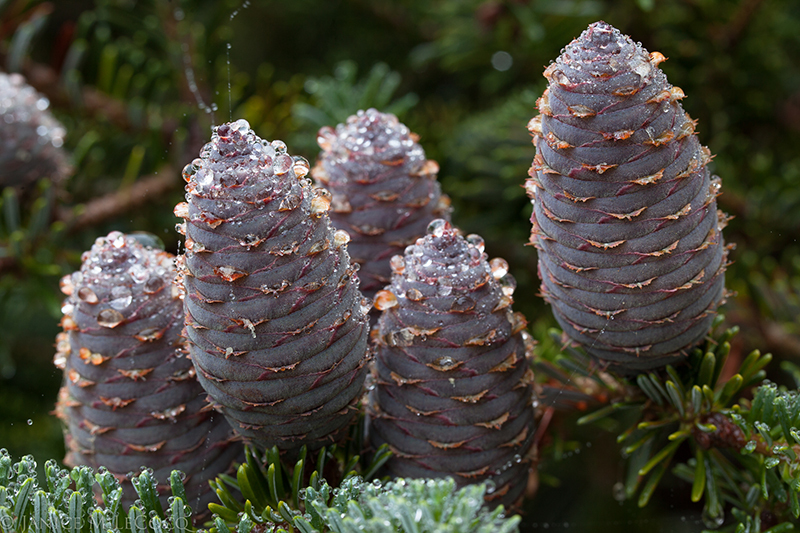 The following series of three images depicts the cones of Abies koreana ‘Horstmann’s Silberlocke’ through the seasons. This tree wears gorgeous foliage even without its ‘jewelry’, and together with its cones makes one of the most decorative specimens in the garden, even giving floriferous angiosperms a run for their money. The cones start out as small, chartreuse gumdrops and then become lavender and celadon eggs with a texture and design that would make Faberge proud. 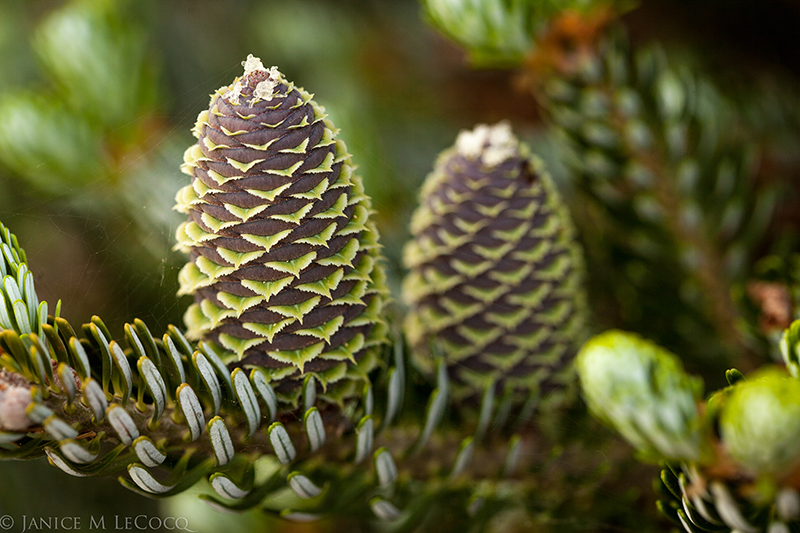 These cones decorate a tree that is already stunning, with its curved silver-lined needles. By autumn they have dried out and matured to rich rusty brown, resembling intricately woven baskets. 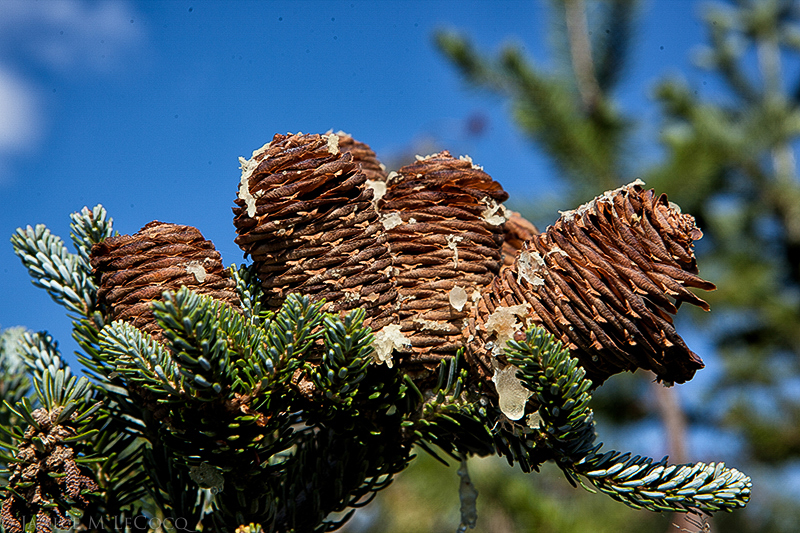 The autumn cones of ‘Horstmann’s Silberlocke’ Korean fir shatter when touched, leaving their spindles. 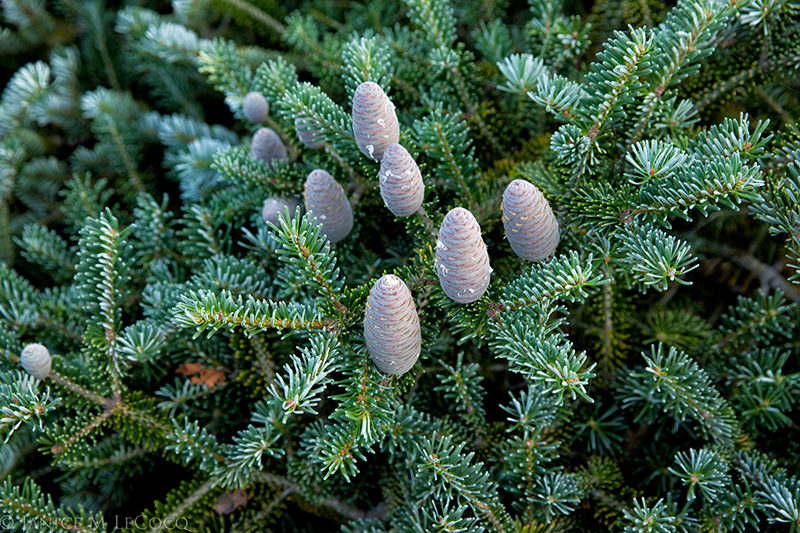 The spruces (genus Picea) in the next two photos, taken at Quarryhill Botanical Garden in Glen Ellen, CA, have similarly shaped cones but with dramatically different colors. Well, some of us like emeralds and others prefer rubies – it’s the same with cones. 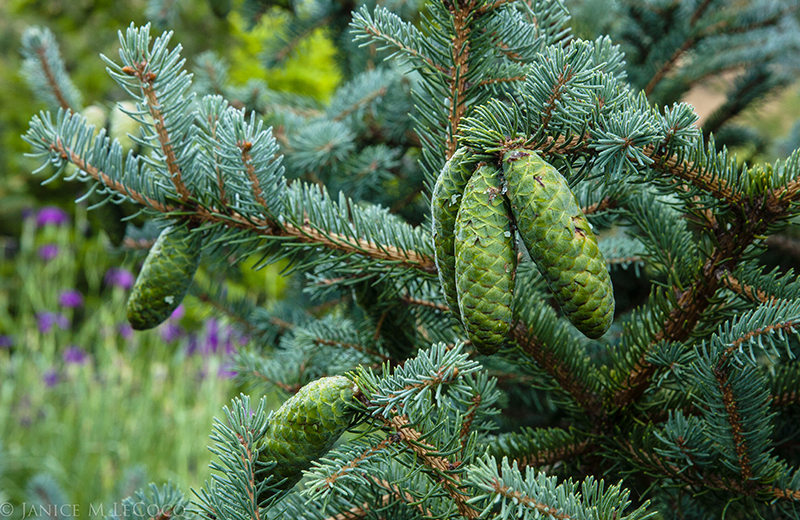 Both Picea wilsonii and Picea likiangensis hail from China, and both get too big for most gardens, but we love to seek them out and enjoy their lovely ornaments. Both of these specimens are large and laden with cones. 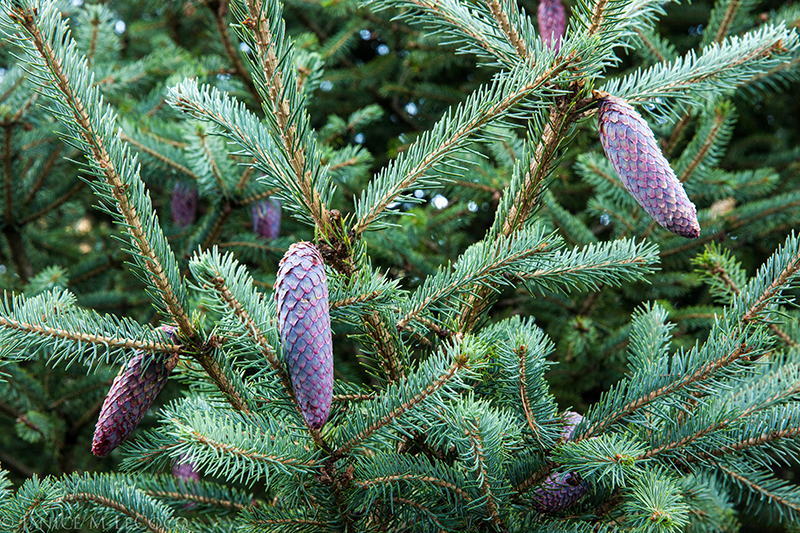 A cone-studded Picea likiangensis specimen at Quarryhill Botanical Garden. 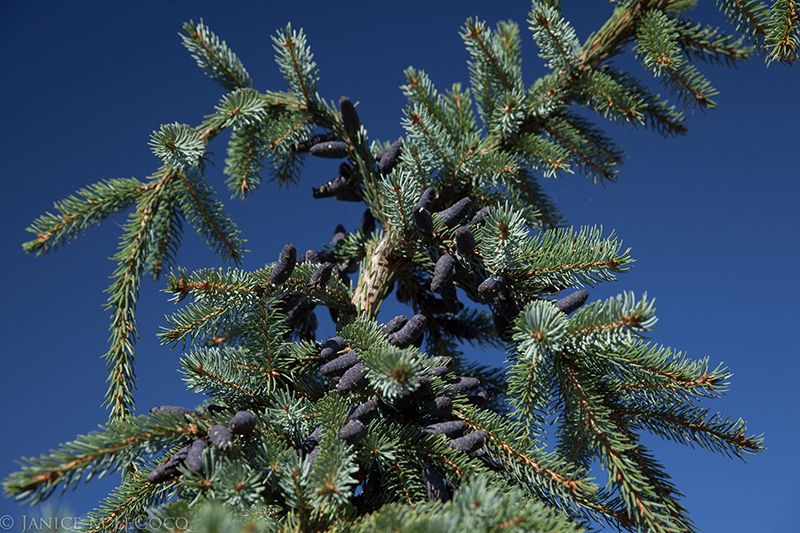 As a general rule, firs hold their cones upright and spruces, as in the two examples above, have pendulous cones. The quite, unassuming ‘Poulsen’ fir (Abies x. arnoldiana ‘Poulsen’ doesn’t put out a huge display of cones every year, but when it does, it’s a showstopper. They start out in spring a rosy black-raspberry, then deepen to grapey purple. By late summer/autumn they have faded to a soft lilac. 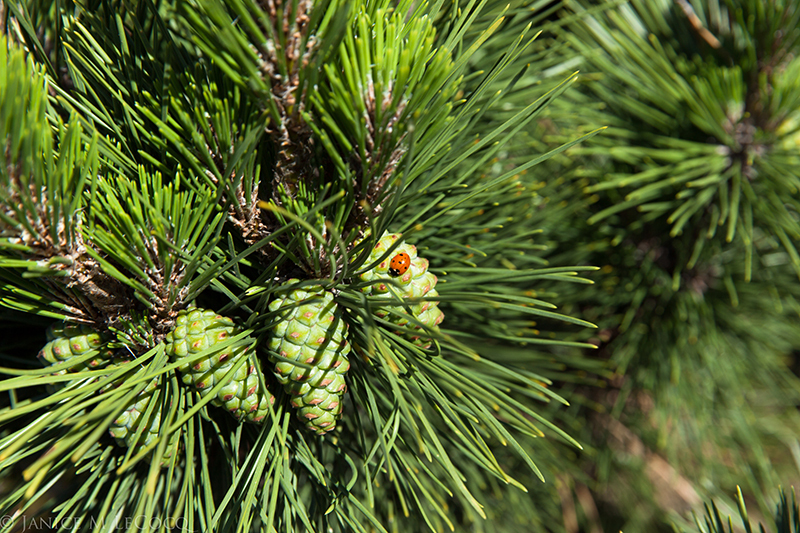 Even though most of us call the cones of all conifers ‘pine cones’, the cones borne by pines look very different from those of the firs and spruces. 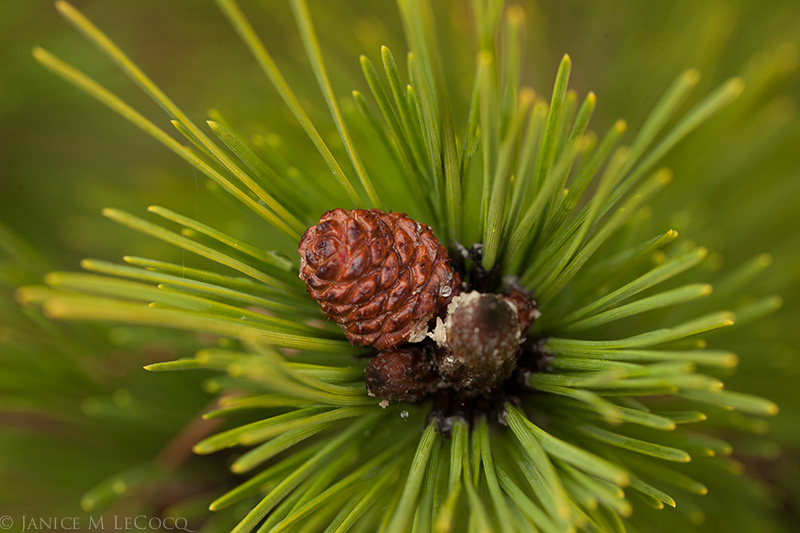 Many of true pine cones look like they are carved out of wood when they are young, as with the new cones of one of the mugo pines (Pinus mugo var. mugho). 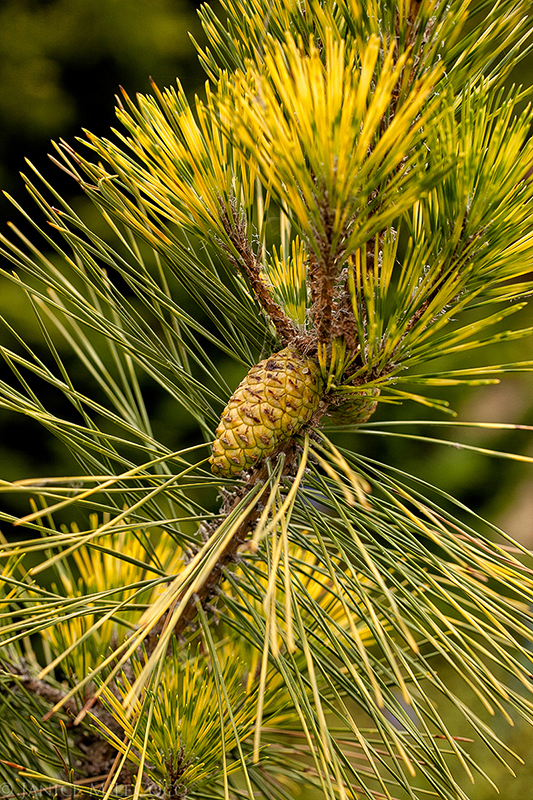 With its yellow cone in early summer, this branch of ‘Golden Ghost’ red pine (Pinus densiflora ‘Golden Ghost’) resembles a bird with flamboyant plumage. The two-toned needles put on even more of a display than the cones! In this photo of ‘Golden Ghost’ we see both this year’s cone (the tiny ‘carved’ one on the left) and last year’s mature cone (on the right). This Japanese black pine (Pinus thunbergii ‘Thunderhead’) is a prolific coner, with lovely green, sculptural cones. 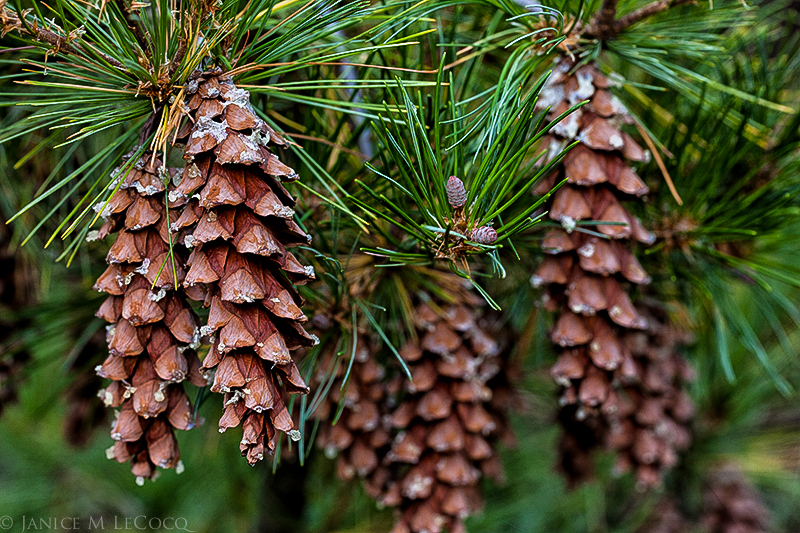 Since we’re moving through the colors, white pines have great cones, too! They are much more fragile than those of the red or black pines, and often have a sap glacee that makes them glitter in the sunlight. We mentioned emeralds and rubies earlier, but some cones are aquamarines. The cones of this Oriental arborvitae (Platycladus orientalis) don’t even look like cones. All of the cones that we’ve shown you so far are females – they contain the ovaries and ultimately the fertilized seeds. But let’s not forget the boys! Unlike much of nature, where the male of the species gets the elegant plumage and fine feathers, in plants the male’s display is generally less showy. 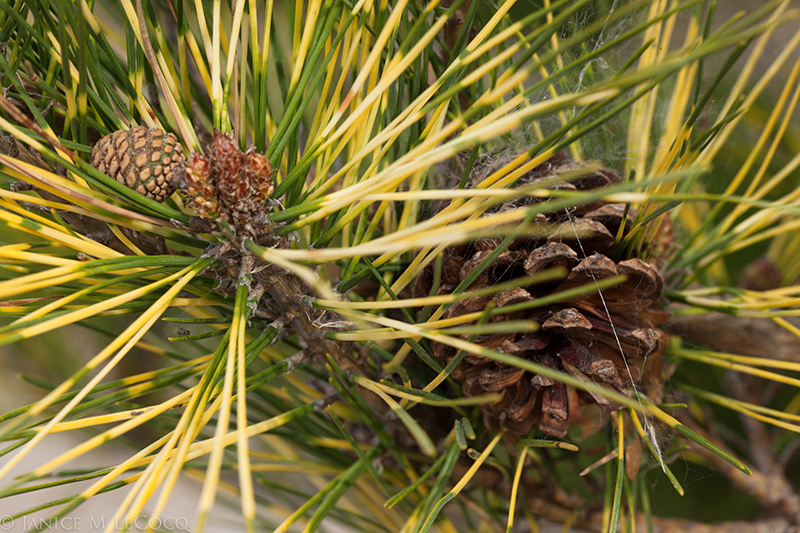 But we think that this crowd of pollen cones on the ‘Golden Ghost’ pine are one of the trustiest signs of spring! So whether you’re walking in your own garden or a botanical preserve such as Quarryhill, when you see a conifer, stop and take a look. If more people don’t start slowing for the Cone Zone, Form and Foliage is going to begin issuing citations! 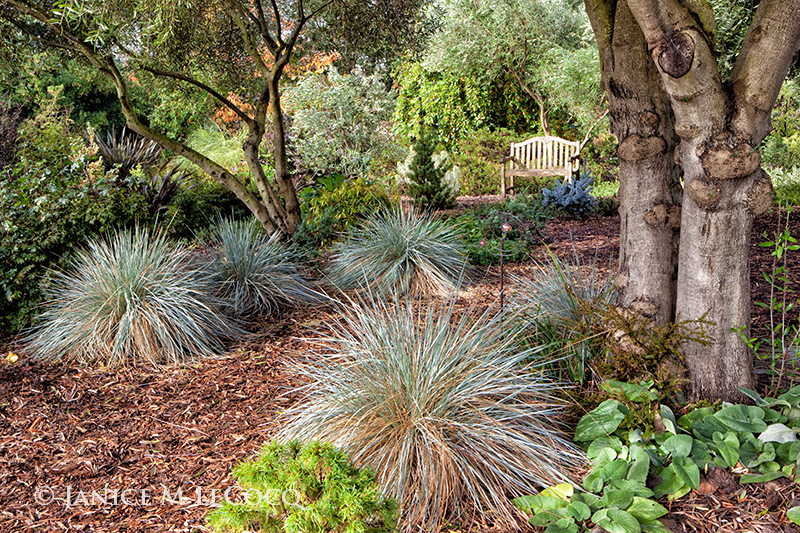 Categories: Circle Oak Gardens, Close ups, Cones, Quarryhill Botanical Garden, Spring, Summer | Tags: Circle Oak Ranch, cones, conifers, evergreen shrubs, evergreens, garden photography, Quarryhill Botanical Garden | Permalink.